St. Martin's Press, 9780312276829, 304pp. Growing up in Bombay, Raghavan Iyer was immersed in a colorful, flavorful world of homemade Southern Indian cooking and irresistible street food (forbidden by his mother and sisters, but too good to pass up). In this touching, vivid, and expert cookbook, Iyer--now a successful caterer and cookbook author--returns to the recipes and memories of his delicious upbringing: rich curries and stews, irresistible rice dishes, spicy chutneys, crispy poori breads, grilled kebabs, savory vegetable samosas, ginger-spiked chai, and sweet fruit desserts. With clear recipes that even a novice can master, this richly woven, deeply personal, and above all authentic cookbook brings Southern India to life. 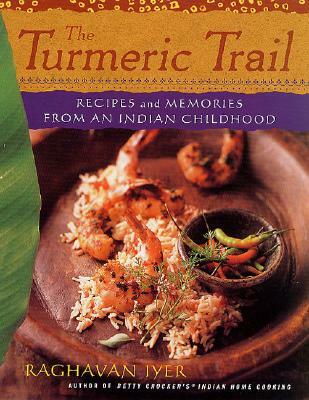 Anyone who likes to cook, loves Indian food, or is fascinated by Indian culture will relish the recipes, anecdotes, and reflections in The Turmeric Trail. Raghavan Iyer is a chef/caterer and cooking instructor based in Minneapolis. His first book is "Betty Crocker's Indian Home Cooking" (Hungry Minds, April 2001). He emigrated to the U.S. in 1982, at the age of 16, and has returned to India several times to research the recipes of his family. He lives in Minneapolis, MN.